A few years after the first World War ended the author of The Green Tunnel stories, G.Gillman, was born in the countryside in Denmark. She had a very happy childhood there until the big recession began at the end of the 1920’s. Her father, who was a builder, then decided that they should move to the capital, Copenhagen, and her life changed considerably. Experiencing the second World War and living under German occupation with all the suffering and killings made her look for answers in spiritual theories. She studied the philosophy of India and found that Reincarnation Theory and the Law of Cause and Effect could explain some of the injustices. After the war she spent some years in the US where she became a member of the Rosicrucian Order and studied in their Neophyte section. Back in Denmark she was introduced to Transcendental Meditation and went on retreat in Norway with the Maharishi. This was before the Beatles discovered him. In the autumn of 1996 she moved to Wales to be near her grandchildren and has fallen in love with this beautiful country and its ancient Celtic history. For the last five years she has studied Metaphysics under Dr.Joan Howell who is the teacher of the Science of Mind at the University of Sedona, Arizona. Simultaneously she has been reading about new scientific discoveries and has learned how much it supports ancient spiritual knowledge. 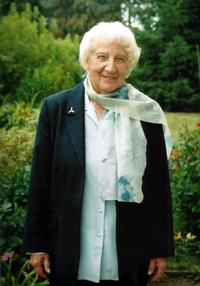 Originally she wrote The Green Tunnel stories for her grandchildren but they have proved popular with so many children that she decided to publish them.